Whether raising money for organic growth, acquisitions, or for a recapitalization event, business owners have several different financing structures to choose from. Each comes with various pros and cons. In the current environment, “senior” or “bank debt” is generally considered the cheapest form of financing. Interest rates and terms will vary but generally are in the mid single digit range. While this type of debt is cheap it also comes with a few stipulations. The biggest of these is that a business (or often a business owner) will need to supply the bank or other senior lender, with a form of collateral. This can come in the form of a lien on business assets, accounts receivable or even a personal guarantee of the owner. For companies that do not have a lot of hard assets or collateral, many business owners turn to equity. Equity is considered cheap short term due to the fact that there is generally no current pay required. The business owner will receive an influx of cash for their business in exchange for giving up some upside later. However, in the long term, equity is the most expensive option for a growing company. Many business owners must give up substantial portions of their company in order to get the money they require for growth. When it comes time to sell, this can cost the owner millions of dollars. Many times business owners choose equity for their capital raising vehicle because they cannot get a bank loan and they don’t know there is another option. Mezzanine financing is a great alternative to equity in these situations. 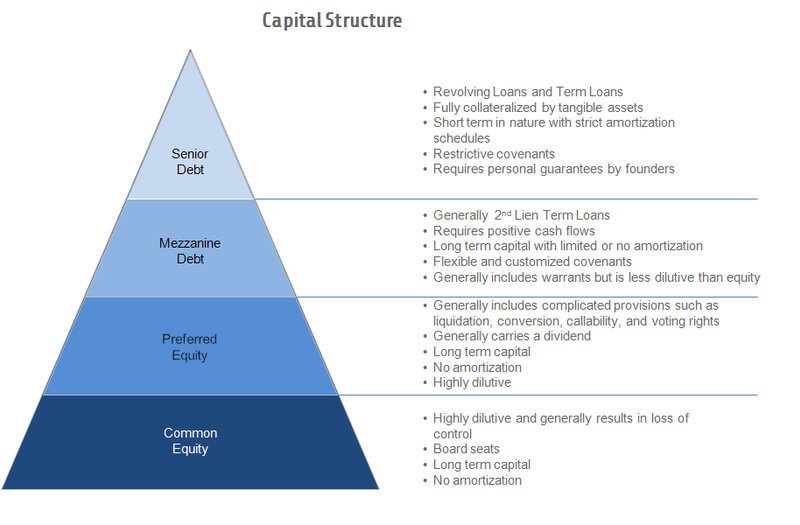 Mezzanine debt is usually structured as a second lien term loan with an interest rate in the low to mid-teens, along with an equity feature, such as warrants. Since mezzanine financing is not directly tied to a borrowing base or an advance on accounts receivable, the collateral requirements are much less stringent than that of senior debt. Depending on the capital need, this allows an owner to take some money out of their business or inject growth capital into their business, without having to give up valuable equity.